World famous Cypriot-American scientist and one of the fathers of reproductive cloning, Dr. Panayiotis Zavos, is announcing the beginning of a crusade to convince the international community that Turkish Cypriot leader, Raouf Denktas is a war criminal and must go. Speaking exclusively to GreekNews, Dr. Zavos who is visiting today his motherland Cyprus, leaves no doubts about his feelings. “Mr. Denktaş is a puppet, he says, a manipulator, a procrastinator, a hypocrite, and above all, he’s a world criminal and a terrorist. I think that an International Tribunal and the world community, should prosecute this man just like they’ve prosecuted Mr. Milosevic, and they would be prosecuting Mr. Saddam Hussein and others that are equivalent to Saddam, Milosevic, and Denktaş”. Dr. Zavos doesn’t believe the upcoming Turkish Cypriot vote, on December 14, will be fair and he hopes that the only way to convince Turkey to remove Denktas is through increased international pressure. 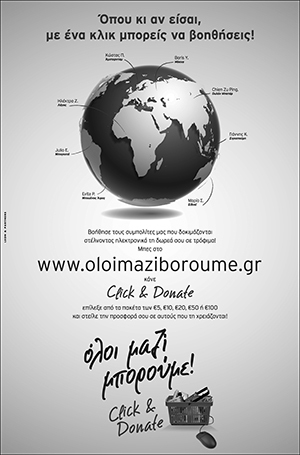 Greeks and Cypriots abroad, he thinks, should undertake this effort, solemnly and joined by other freedom lovers. Q: First of all, you know that on Dec 14th, in the occupied areas, they have a vote, the so-called elections. A: Call it so-called because it’s not a legitimate system that functions under any international law. The Turks, as you know, have been cooking things for the last 29 years. What prevents them from cooking another one this time? That obviously remains to be established. Q: The United States government with statements, the latest made last Monday, claims that this could be a referendum for a solution; do you think this is the case? Second, do you think that Denktaş, who is an obstacle to any progress, can be removed this way? A: Not necessarily. I think that it’s not the first time that the State Department and the United States government have really been manipulated by the Turks. Therefore, nothing would surprise me if that were another hoax for the Turks. I think that we need to examine historical data of 29 years, where various U.S. administrations have obviously expressed “optimism” in an ironic way. I think that George W. Bush and the State Department and others have a large conglomeration of problems that they need to address, and therefore, they’re hoping this time that the Cyprus problem is going to sort itself out without aggressive interference on their part. They think, and it’s ironic that they think that way, because they cannot go back and examine 29 years of an established JUNTA, whatever you want to call it, on the north part of Cyprus; and wishing that this time the Turks are going to really come out with the right recipe. I’m sorry that Denktaş is a puppet of the Turkish government. I don’t think any vote or any maneuvering on the north part of Cyprus by the populous is going to change anybody’s mind, as far as this particular aspect is concerned. Unless the world community takes some really aggressive action on this problem, it will never be solved. I need to clarify that, by saying that recent statements by the chief of the military in Turkey, a general, stated that Cyprus and the north part of Cyprus is very important to Turkey militarily, in order to defend Turkey. It is beyond comprehension obviously, that they’re thinking that way, that the country of Turkey, many times bigger than the north part of Cyprus, can be defended from Cyprus. But that’s the attitude that they have, and that is the attitude that they convey to the world, that Cyprus is an important territory for Turkey and they’re not going to hand it over to you, me or anybody else that easily. A: Mr. Denktaş is a puppet, a manipulator, a procrastinator, a hypocrite, and above all, he’s a world criminal and a terrorist. When I say world criminal, I think that the world court and the world community should prosecute this man just like they’ve prosecuted Mr. Milosevic, and they would be prosecuting Mr. Saddam Hussein and others that are equivalent to Saddam, Milosevic, and Denktaş. A: So what is your suggestion, doctor? Q: Well, my suggestion is that the world community, and obviously it needs to start from within the Cypriot community, we need to take some really aggressive action against Mr. Denktaş, to show to the world the exact colors and the exact mentality and the attitude that he represents. Mr. Denktaş would never have lasted in Cyprus for 24 hours if he did not receive the proper support he receives from Turkey. Anything else that goes on in Turkey is nothing but manipulation after manipulation. I think that the new government supposedly is a clean government, but obviously as we all know, Turkey’s never had a clean government democratically elected by the populous and which was not under the thumb of the Turkish military. Therefore, I think that this government, just like any other government, answers to the military; and the military is the one that rules Turkey, and then when it comes down to it, they are the ones that eventually would make the ultimate decision of really taking action and resolving the Cypriot problem and it should be resolved according to the United Nations resolutions. Q: What are you planning to do? A: Well, I think a Cypriot concerned about his motherland is obviously somebody who can analyze the facts as they appear; it is very clear to me that Mr. Denktaş, the so-called leader of the Turkish Cypriots, which of course are a minority in comparison to the Turkish occupiers who are currently in the northern part of Cyprus, can come up with a recipe that can solve the Cyprus problem 29 years later. I’ve visited the north part of Cyprus, and I can see two different situations, as far as economy, mentality, attitude, etc. Therefore, I think that Denktaş is a puppet, is one of the greatest manipulators as far as the Turkish occupation is concerned, and that I as a Cypriot see very clearly, that unless people like me take the necessary action to educate the world and warn the world about who the Turkish occupiers are in Cyprus, and put the right pressure on the right location; there will be no solution to the Cyprus problem. Q: What will be the role for this community, and what would you suggest for the Greek Americans to do vis-a-vis their government and congress? A: I think the government of Cyprus as far as I’m concerned, should remain focused on the political issues that concern Cyprus today in the world arena, and Cyprus is a very important country in the world community because of its unique location, history, and people. However, as unique as we may be, it’s possible that we are a very good breakfast, lunch, or dinner for people like the Turks, as was the case in 1974. Therefore we need to be very careful. So, I’m urging the Cyprus government and Mr. Papadopoulos to continue to do the job that they are doing, which is an outstanding one and take charge in the international arena as far as concerning the prosecution, the isolation, the identification of Mr. Denktaş as a world criminal and a terrorist to the world community. Q: So, do you make a similar call to the Greek Americans here to start pushing the government? A: I am making a similar call to the Greek Americans, to the Cypriot Americans, and to the world community to wake up and listen to the cries, as they’ve been crying for the last 29 years, and that is Mr. Denktaş is committing crime after crime, and there is ample evidence to show that. Q: On practical matters, doctor, how can we act? 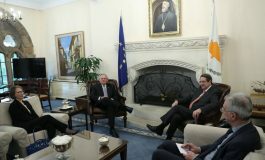 A: Well, I think that the immediate action should be initiated by the Greek-Cypriot community throughout the world, whether it will be the U.S.A., England, Europe, Australia, and other places on earth where the Greeks and the Cypriots have really been very successful to initiate a necessary action and warn Mr. Denktaş that he’s not regarded as a leader, but he’s regarded as a world criminal and a terrorist, and that he ought to stop his current behavior, and participate in resolving the Cyprus issue to the best interest of the Greek and Turkish Cypriots, and not to the interest of the Turkish military and the Turkish government.